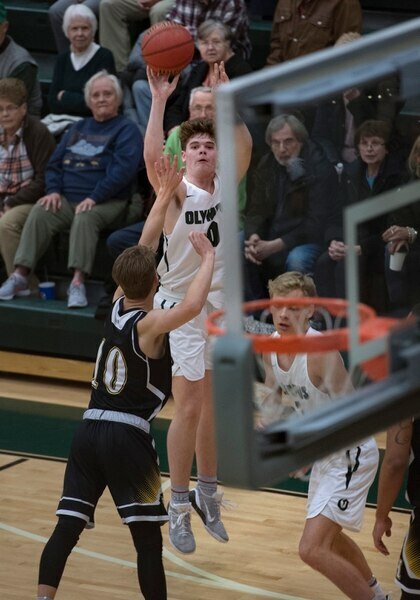 (Scott Sommerdorf | The Salt Lake Tribune) Jeremy Dowdell splits the Highland defense to score during first half play as Olympus defeated Highland 70-49, Friday, January 19, 2018. (Scott Sommerdorf | The Salt Lake Tribune) Jeremy Dowdell struggles to regain control of a loose ball during second half play as Olympus defeated Highland 70-49, Friday, January 19, 2018. (Scott Sommerdorf | The Salt Lake Tribune) Jeremy Dowdell scores one of his three-point shots during first half play as Olympus defeated Highland 70-49, Friday, January 19, 2018. (Eric Butler | For The Tribune) Jeremy DowDell, Olympus High (Trent Nelson | The Salt Lake Tribune) A young American Fork fan works on distracting Olympus's Jeremy DowDell at the free throw line as American Fork hosts Olympus in the Utah Elite Eight tournament, Saturday December 9, 2017. (Trent Nelson | The Salt Lake Tribune) Olympus's Jeremy DowDell gets a taste of Bingham's Dax Milne's finger as Olympus faces Bingham, high school boys' basketball at the Utah Elite 8 tournament in American Fork, Thursday December 7, 2017. Leah Hogsten | The Salt Lake Tribune Olympus' Jeremy Dowdell had 25 points in the game. Olympus High School leads Timpanogos High School 53-27 during their 4A State boysÕ basketball quarterfinal playoff game at Weber State University's Dee Events Center, Thursday, March 2, 2017. Leah Hogsten | The Salt Lake Tribune Olympus' Jeremy Dowdell is fouled by Timpanogos' Derik Eaquinto. Olympus High School defeated Timpanogos High School 91-69 during their 4A State boys’ basketball quarterfinal playoff game at Weber State University's Dee Events Center, Thursday, March 2, 2017. Leah Hogsten | The Salt Lake Tribune Olympus' Jeremy Dowdell reacts to sinking a 3-pointer. Olympus High School leads Timpanogos High School 53-27 during their 4A State boysÕ basketball quarterfinal playoff game at Weber State University's Dee Events Center, Thursday, March 2, 2017. Steve Griffin | The Salt Lake Tribune Olympus guard Jeremy DowDell looks up to see if his shot went in after crashing into Wasatch guard Brandon Maxwell during 4A playoff game at the Huntsman Center in Salt Lake City Tuesday February 28, 2017. Steve Griffin | The Salt Lake Tribune Olympus guard Jeremy DowDell shoots the ball as he crashes into Wasatch guard Brandon Maxwell during 4A playoff game at the Huntsman Center in Salt Lake City Tuesday February 28, 2017. 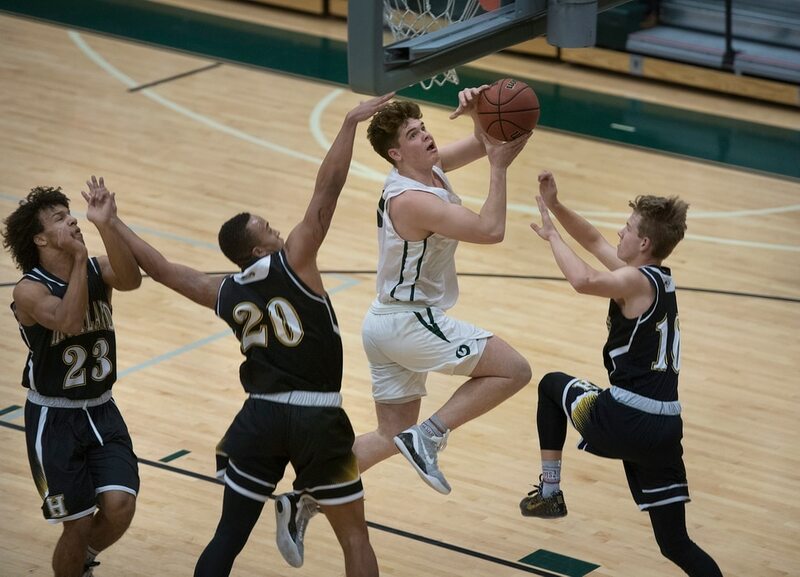 Holladay • He’s only a junior, but Olympus basketball player Jeremy DowDell already has been exposed to a well-worn bit of wisdom about undefeated teams entering the postseason. You know, the one about how it’s good to get a loss going into the playoffs rather than carry the burden — and pressure — of staying perfect all the way to a championship. “We’re not worried about that. Ever since the first few games of the season, we were 5-0, 10-0, 15-0, we’ve always had a target on our back,” DowDell said. “After every single win, the target just kept getting bigger. DowDell, who is averaging 21 points a game, is a big part of one of those rare unbeaten teams that has made it through the regular season without a blemish. In fact, Olympus essentially has cruised through its schedule. The narrowest victory was three games into the season when the Titans beat Bingham by four points. Only one other time, a 76-59 win over Orem in January, has the margin been less than 10 points. Since Bingham is in Class 6A and Orem resides in Class 4A, neither of those games seem to portend any particular problems for the Titans in the Class 5A playoffs. Then again, Olympus was a strong favorite a season ago before getting shocked by an upstart Springville team in the state championship game. And when the Titans have been involved in a rare close game, coach Matt Barnes has shown a propensity to stick with his five starters and maybe one off the bench for the entire 32 minutes. So foul trouble might be an issue in the playoffs, but DowDell thinks the Titans will be able to adjust. DowDell is the leading scorer for the Titans, whose offensive engine is run by point guard Rylan Jones, a University of Utah recruit. Fellow starters Harrison Creer (17.9 ppg) and Spencer Jones (10.7) also are averaging in double figures, while the fifth starter is none other than Jeremy’s older brother, senior Jacob DowDell. 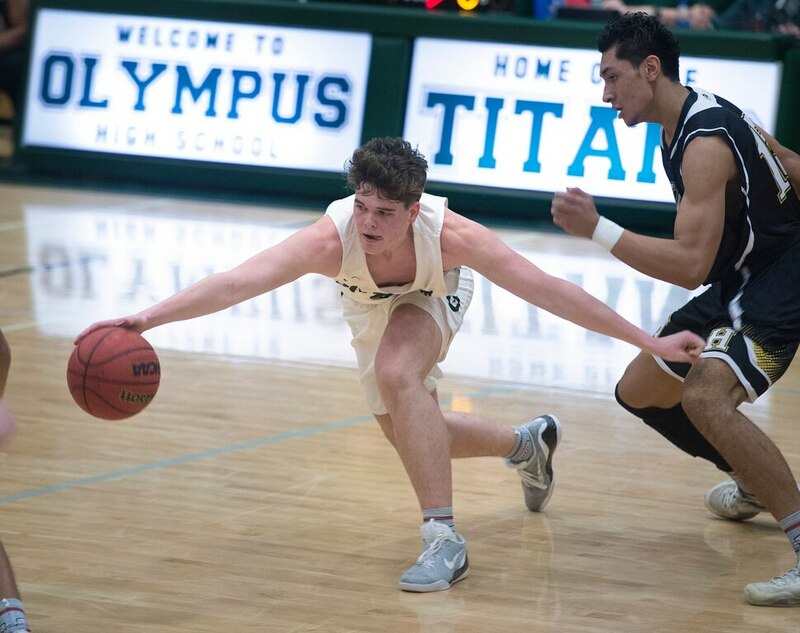 The Titans have lit up the scoreboard at times, most notably a two-game region stretch where Olympus laid 106 points against Skyline and did it three days later against West. Jeremy DowDell scored 35 points against the Eagles in the first contest, while Rylan Jones poured in 32 against the Panthers. With all those points being registered, DowDell doesn’t pretend not to know his numbers. Olympus won the Class 4A state title in 2016 and brought home the first boys’ basketball trophy in school history. After last year’s run to the finals, Olympus moved up to Class 5A when the state’s high schools expanded to six classifications. The Titans play Brighton in Monday’s first round of the state tournament, and Barnes will be looking for his shooter to do his thing. And if defenders move far out to cover DowDell’s extensive range — “It’s kind of a scary thought. Sometimes you think he’s shooting from 30, the next time it’s from 35,” Barnes said — there’s a downside to that because DowDell can go by opponents to the basket. DowDell hit a pair of treys early then attacked the hoop, eventually finishing with 34 points against Orem.